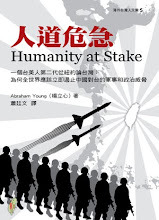 HUMANITY AT STAKE is a pamphlet-book that depicts the true conversation that occurred amongst three inquisitive people who engaged one another. 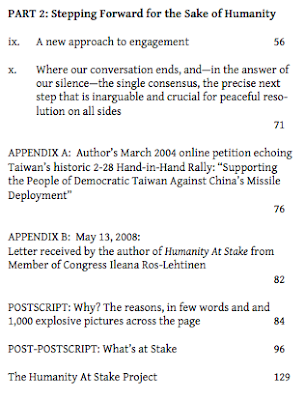 It is written for the purpose of bringing the politics of Taiwan, China, and America towards all of our consciences and conversations. In so doing, dialogue removes those politics from reclusion and dangerous misunderstanding. On a broader level, HUMANITY AT STAKE is a reflection of - and a tool for - the issue of human rights for all, free people. If you are an English language publisher or agent, and have an interest in acquiring rights for the self-published Humanity at Stake, please contact the author. 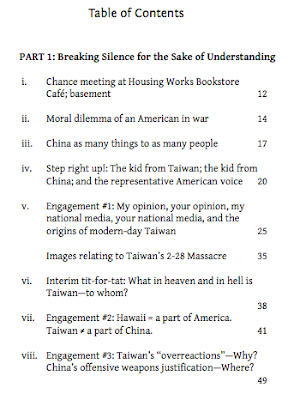 If you are a Chinese language book company or distributor, and have an interest in distributing copies of 人道危急 anywhere outside of Taiwan or the US, please contact Taiwan Publishing Company at TaiwanHumanity@gmail.com. A portion of each purchase will be donated to the not-for-profit organization Human Rights Watch, "Defending Human Rights Worldwide." For any further information regarding the book, please contact the author at Abraham.L.Young@gmail.com.